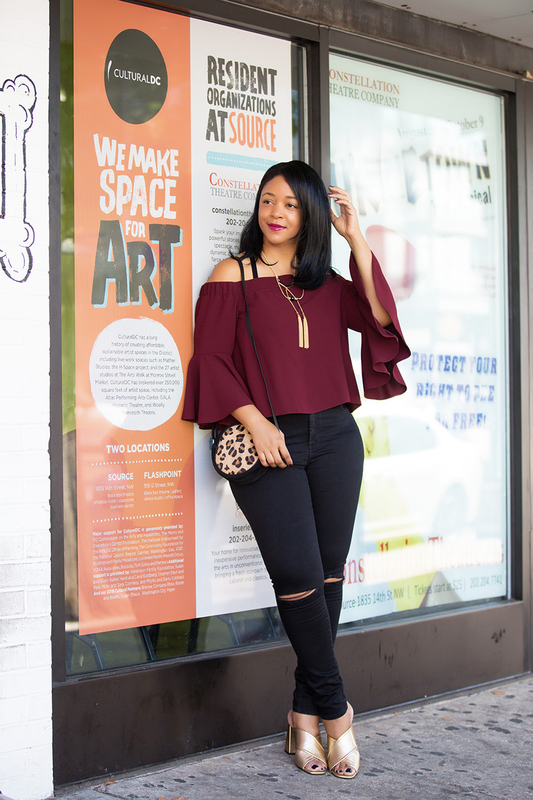 Washington, D.C. may be best known as our country’s political epicenter, but it’s a great community for creatives as well! Since moving here from New York City, I’ve had to find my place here, as well as places that feed my creativity and cultivate my lifestyle. 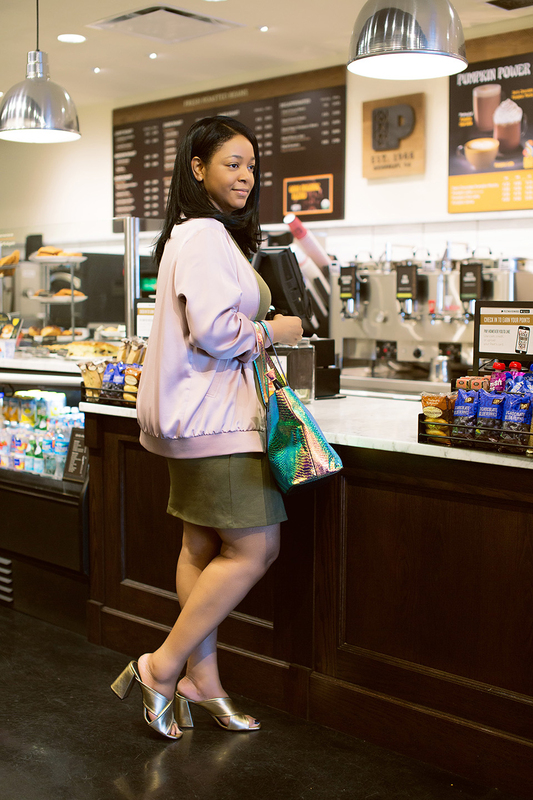 I’ve finally settled into a great routine, and I’ve partnered with Topshop.com to share my day to night life and style, living in Washington, D.C.! 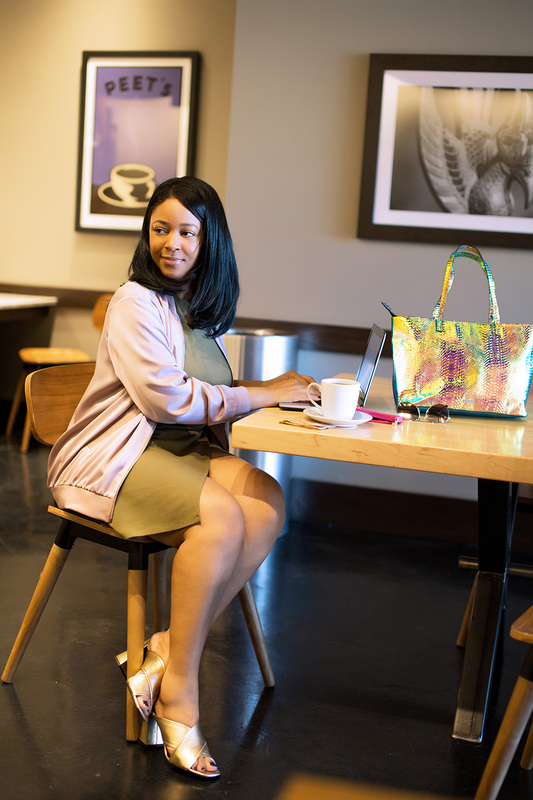 When I moved here a few years ago, I immediately was thrust into the freelance life, and as a freelancer, it’s very tempting to just roll out of bed and work in your pajamas. But I like to live life as a freelancer just as I would when I was working a traditional 9-5. That means I get up early, have breakfast, and then head out to my ‘office’ – (aka, my local coffee shop) to start work. I know you’ve heard that saying, “But first, coffee.” Well, that definitely applies to me, as I can’t start my day without it! The coffee shop doubles as a place for me to get fueled up, as well as dive into work. Since I usually spend a few hours working at the coffee shop (writing and editing blog posts, reading and responding to emails, pitching brands and applying to blogger opportunities), I need something to wear that’s comfortable to sit in for a while. But in case I have an afternoon meeting, I also need to wear something that’s stylish. This wrap dress from Topshop.com perfectly combines comfort and style. I added a trendy bomber jacket to throw over my shoulders when I get cold. 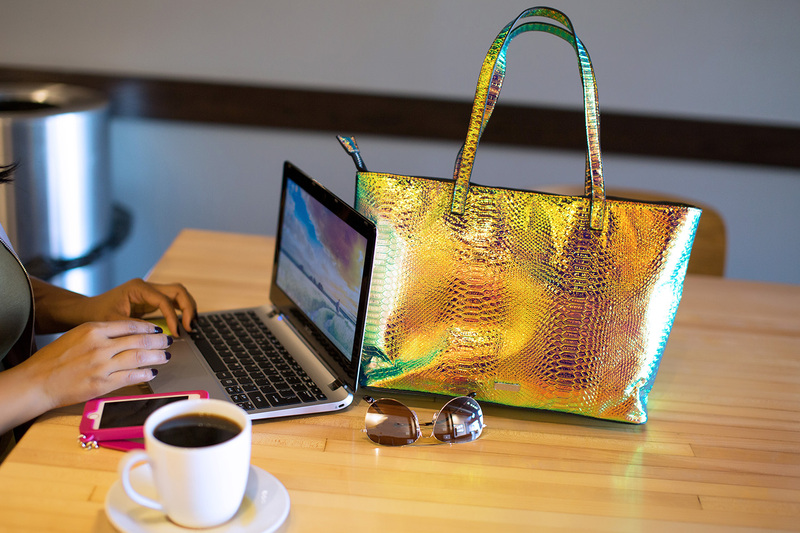 Because I’m all about the accessories, I had to snag a standout tote bag to carry my laptop in. And I added these gold mules that are also on-trend right now, and amazingly comfortable. After working for a few hours, I head out of the ‘office’ to make some calls and grab some lunch. Sweetgreen and Cava Grill are two of my favorite lunch spots where I can get a nice, hearty salad or rice bowl to give me fuel to run my afternoon errands (aka, shopping, usually). Also, I try to get in some sort of a workout every day. I love to go for a run in Rock Creek Park, or do some yoga or Tae-Bo at home. A comfortable T-shirt and leggings is all I need, like these pieces by Ivy Park , Beyonce’s activewear line for Topshop . I’m a night owl, so the evening is when I really come alive! There’s plenty to do in D.C. at night, whether you love music, dining, bar-hopping, or pretty much anything else! My first love may be fashion, but my second love is comedy! Little known fact about me: I’ve been doing improv for several years now and I absolutely love it! I started taking classes when I lived in NYC, and continued once I moved to D.C. I recently completed the program at Washington Improv Theater, where I’ve also performed as part of an improv group. I also enjoy watching friends of mine, as well as my former teachers, take the stage and perform! Before heading to a show, I like to grab dinner and drinks nearby. My night outfits typically consist of a chic top and ripped skinny jeans. It’s what I feel most comfortable in, and with the right pieces, makes a statement. 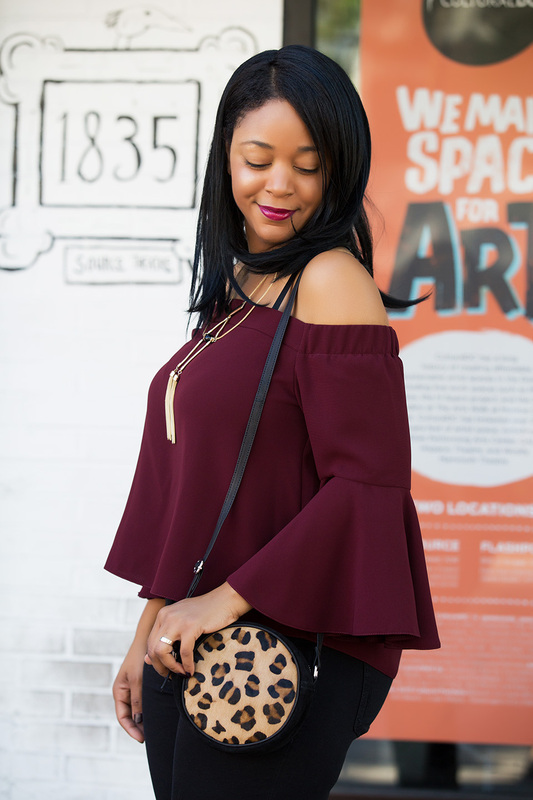 This bell sleeve, off-the-shoulder top is right on trend, and the burgundy color is so perfect for Fall. 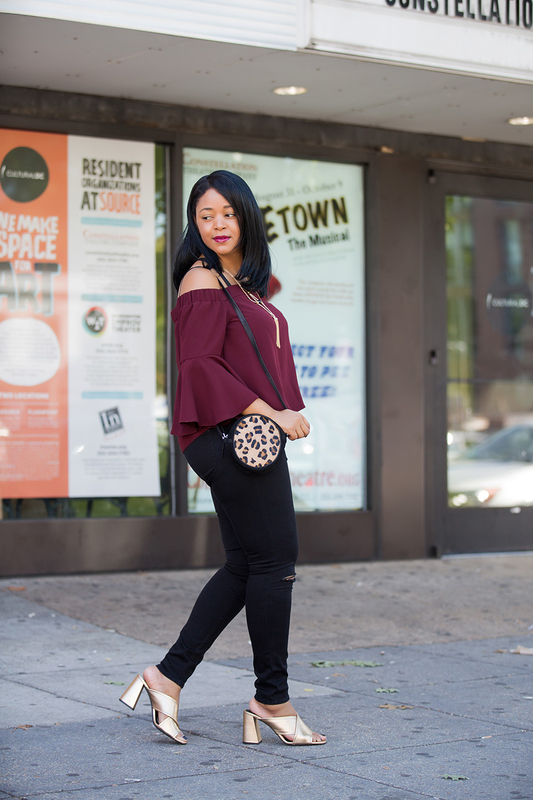 I paired it with a gold necklace, ripped moto jeans, a crossbody bag, and those comfy and chic gold mules, all available at Topshop.com . How do you like my day-to-night style? Visit Topshop.com to shop my looks, or create your own day-to-night looks. Special thanks to Topshop for sponsoring this post. All opinions are my own.